Just yesterday, I had a nice comment on my latest post from a lovely girl named Kaitlyn, from Kaitlyn's Simply Vintage. 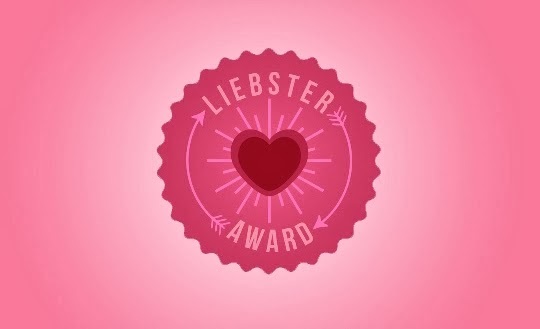 She told me she had nominated me for a Liebster-award. You must answer the 11 questions set by the blogger who nominated you. You yourself then pick 11 blogs who in turn have under 200 followers. You must then think of 11 questions for the blogs you have picked and also tell them. You must link back to the blog that nominated you. I think it mostly was down to curiosity, "can I manage to make a blog?". But as I realized that I indeed could, it turned out a great way to keep myself motivated, and organized. I liked having somewhere to track my progress. Blogging well is kind of hard work, and getting nice comments on your extra effort is very satisfying. 2. What is your favorite piece of music? Oh.....tough one. There is so much nice music out there, and I listen to so much different stuff. I guess my answer would be whatever matches my mood at a given moment. Funk and Rockabilly is never wrong though! 3. Do you thrift shop? If so, what purchase are you most proud of? We actually do have one thrift shop where I live. I've been meaning to go (for years) but never get round to it. Weird, because I love all kinds of old stuff, flea markets and thrift stores! 5. What colors are the walls in your bedroom? They are a yuckie yellowish color. Me and Mr. Pinhouse bought our house 3 years ago, and redecorating bedroom is now high on the to-do-list (mine, anyway)! I dream of soft grey and white, with a contrast wall of driftwood (there will be discussions, I know...) Heh! 6. What is the best piece of advice your parents ever gave you? All of them, probably. I was just too young and stupid to listen. "Get an education" is high up there! 7. What would your dreamhouse be? 8. What creative pursuits do you follow? I am good at switching focus, and there is sooooo many things I want to master. I am however, determined get more practice playing my didgeridoo! 9. Are you a morning person? 10. What is your ideal fashion item? Go check them all out, some are currently hosting give-aways!! Yay! If you could choose any super-power, what would it be? Which object/tool could you not do without on a daily basis? What is your dream destination for travel? Which wild animal do you find most fascinating? What is the most romantic thing anyone's ever done for you? If you could make a living doing anything, which profession would you choose? I have moved 18 times in my life. I have eaten bugs on purpose. I once slept for 32 hours in one go. Snow makes me happy. The more ,the better! I talk to myself out loud when I am alone. I physically can't sing when someone is listening. 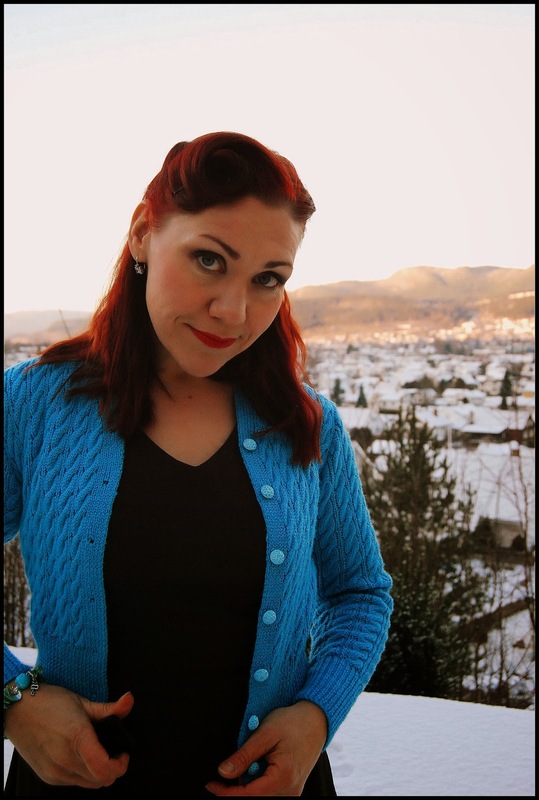 I was Norwegian Champion in hairdressing for apprentices in 1998. I love travelling alone, no matter how far. When I was young, me and my best friend "adopted" a baby crow that had fallen from the nest and hid it in our basement. We nursed it until it could fly, and then released it. I cannot wear rings on my fingers. I loose them. Thank you for nominating me, Kaitlyn! This was actually quite hard, but very fun :) Can't wait to see what my nominees answers on my little "quiz"! So I am happy to present to you; my entry for the Knit for Victory challenge/ knit-along hosted by Tasha. The pattern is 'A New Design in Cable Stitch', free from the V&A Museum online. I initially wanted a green cardi, but the one shade in the store didn't turn me on so I ended up with this light blue, and I quite like it. The buttons are not vintage, but cute shanked plastic buttons with flowers on them in a "frosted" look. The only thing I didn't like is how the cables don't meet up on the shoulders. Due to the decreasing on the back piece armhole shaping, it doesn't add up when assembling the cardigan. Purely cosmetic, I know, but being a perfectionist things like that annoy me. 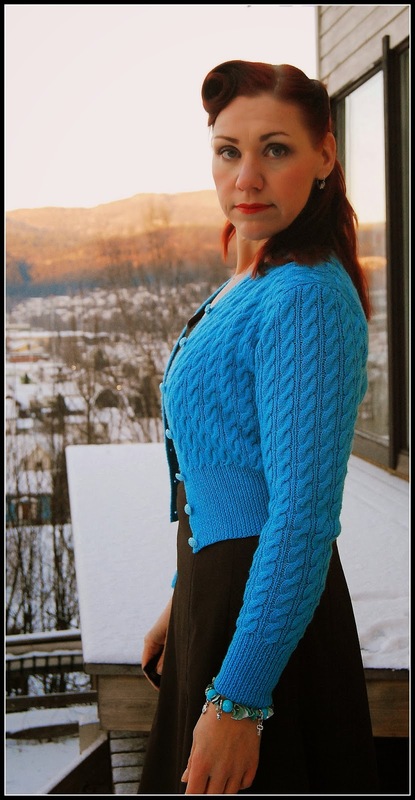 If I was to knit this one again, I probably would make it slightly longer, so that the junction between ribbing and the cabled portion would hit my natural waist. But it was hard to tell during knitting if I would get into it at all! This project taught me a lot, and next time I will be able to better adjust these things. 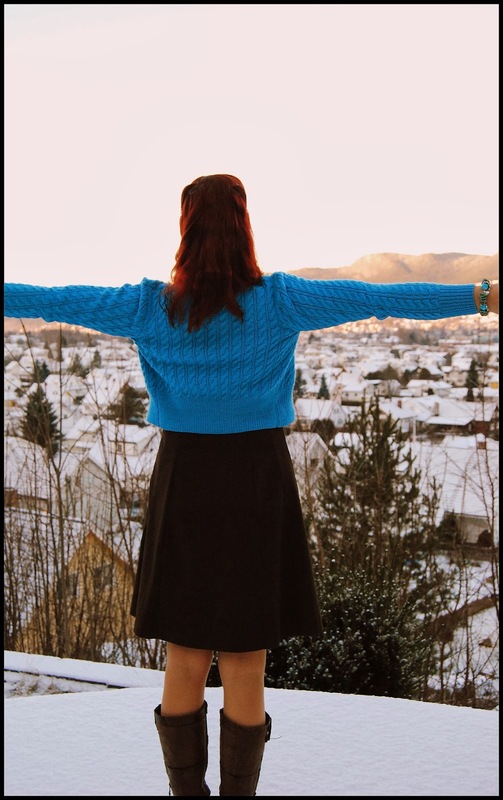 After all, this is only my second knitted garment (other than socks, mittens, hats and scarves) and all in all I like this cardigan very much. 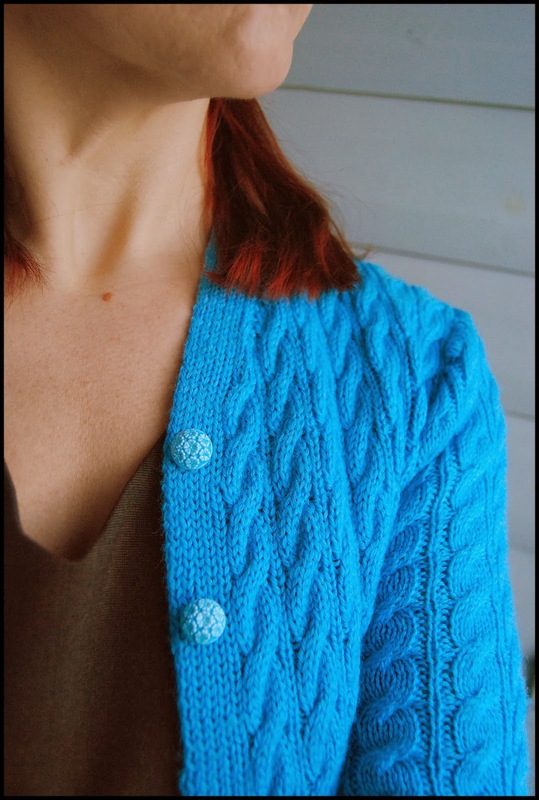 I've seen multiple versions from other knitters in all kinds of beautiful colors and with fun buttons. It looks gorgeous in black! 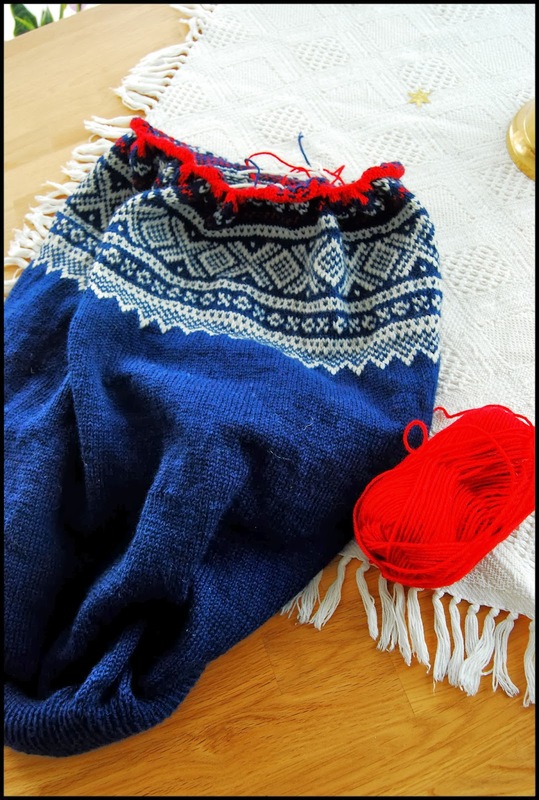 On another note, my hubster uttered a request for a sweater, so I am now busy with a traditional Norwegian 'Marius'-sweater. It was designed in 1953, but is based upon stitch patterns from the 20s and 30s. 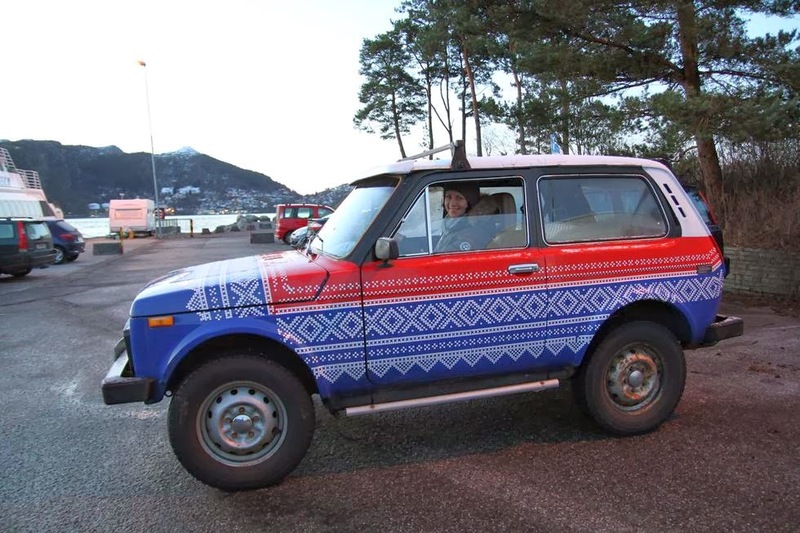 It is named after war hero and skier Marius Eriksen, and is very popular in Norwayland these days. The design is on everything from coffee mugs to Ipad-covers, even cars!! I cast on Dec. 23rd, knitted the whole body on the round, found out it was too small (even for me!!! ), frogged the whole buggar, and started over a week ago....sigh. So, tell me; what are you working on? ?